bb Interiors modernized a Tuscan-style home with new artwork, lighting and custom reupholstery. Ian incorporated blue tones, from the midnight blue of the staircase runner to the navy zebra fabric on the dining room chairs, to tie the room together. The result is a fresh, modern look that still pays homage to classic pieces and traditional design. Functional, flowing style was front of mind when it came to redoing this small home. The bb Interiors team found creative ways to expand storage space and breathed life into the space. In addition, Claudia worked with Past Basket to design a stylish, open kitchen that doubles as a space for people to gather. Traditional meets modern in this lively brownstone full of family heirlooms. Custom pillows and upholstery in buffalo check, a navy statement wall and new drapery panels made the home more vibrant without feeling unfamiliar. Ian's attention to details like the gold tones and the subtle navy archway make the common spaces look and feel more cohesive. To ensure that our longterm client's home was perfect, Claudia collaborated with the builders to pick out interior surface finishes. After the structure was ready, our team proceeded with selecting furnishings and accent pieces to make it a home. Custom lighting and well-selected pops of color brightened the space and the classic details, from chair legs to side tables pulled it together. This whole home redesign incorporated a sophisticated personal study with custom drapery and upholstery. Our client’s love for monochromatic style was reflected through the black, white and metallic accents in the open cabinets behind the stately desk. 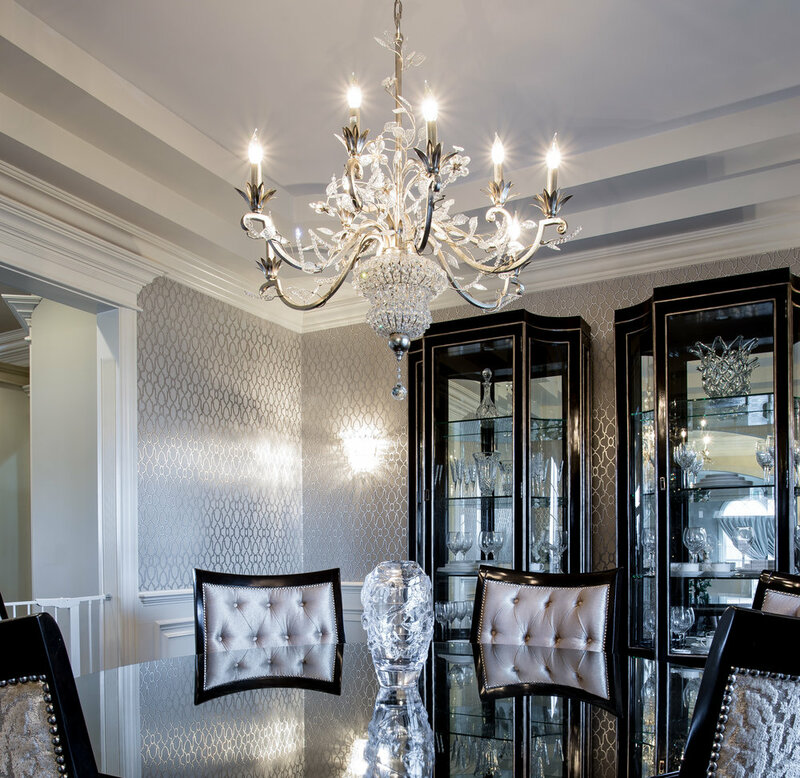 Custom art and glamorous light fixtures complete the home.